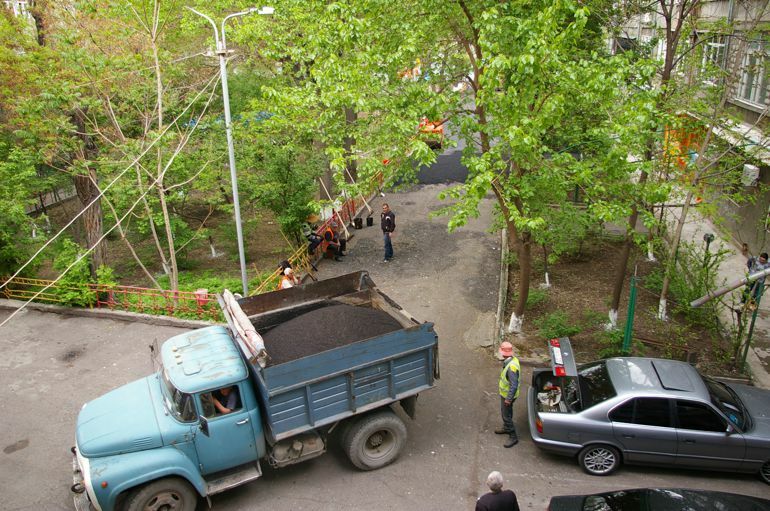 Two days ago the Yerevan municipality was repairing the roadway through the courtyard behind the apartment building where I live. Huge potholes ran along the pavement making both driving and walking troublesome. They also installed brand new lighting on the walls of the tunnel leading into the courtyard, making the evening stroll back there less ominous. 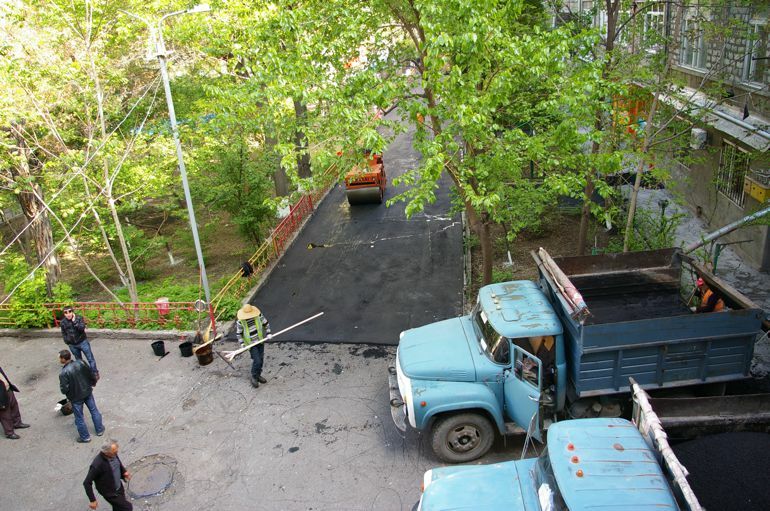 But repairs are being made in other parts of my neighborhood, too. 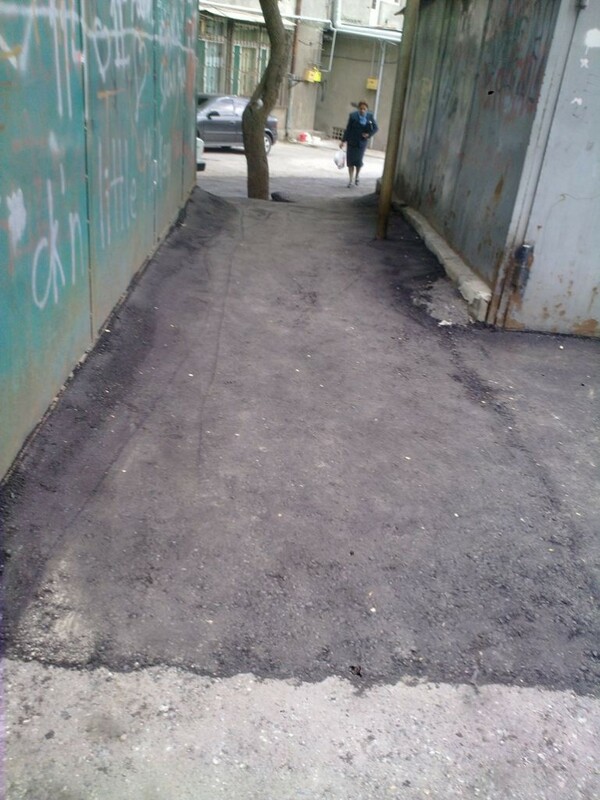 Here’s a photo of a commonly traveled shortcut between two garages up the street that has been completely repaired, the exposed rocks, concrete and broken asphalt covered over. 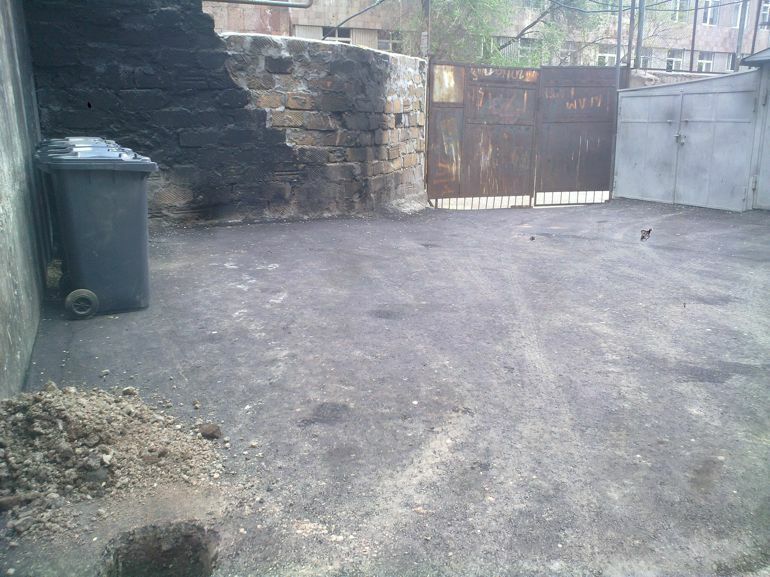 The area in front of my rented garage (above photo), which was laden with potholes and strewn trash thanks to the location of the garbage bins, has also been redone. The ugly metal cans have been replaced with new, heavy-duty plastic bins that have folding lids, so the broken styrofoam and cellophane bags won’t fly around any longer when a gust of wind blows. The walls have also been patched up since this was taken. 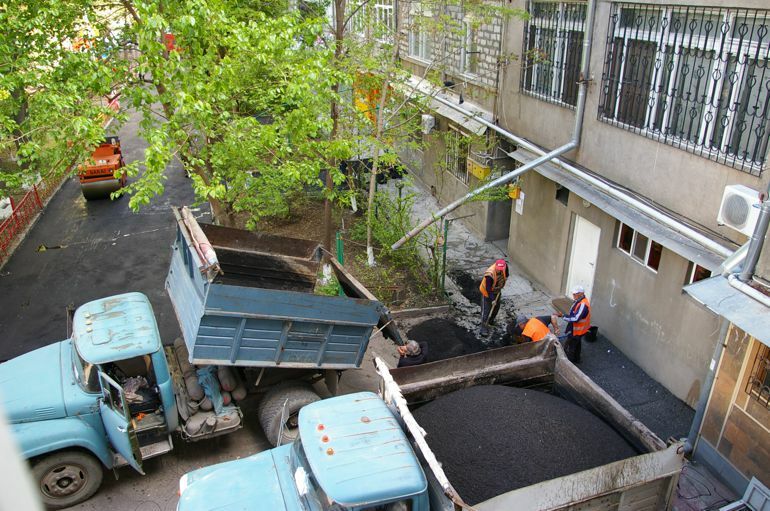 Critics will cynically argue that city hall is making all sorts of cosmetic repairs around town, like changing the curbstones (which I do think is a needless expense), as a way of vote buying. But I don’t see it that way. Rather, I see my tax money being put to good use. I want the taxes I paid to be spent on improving my community. 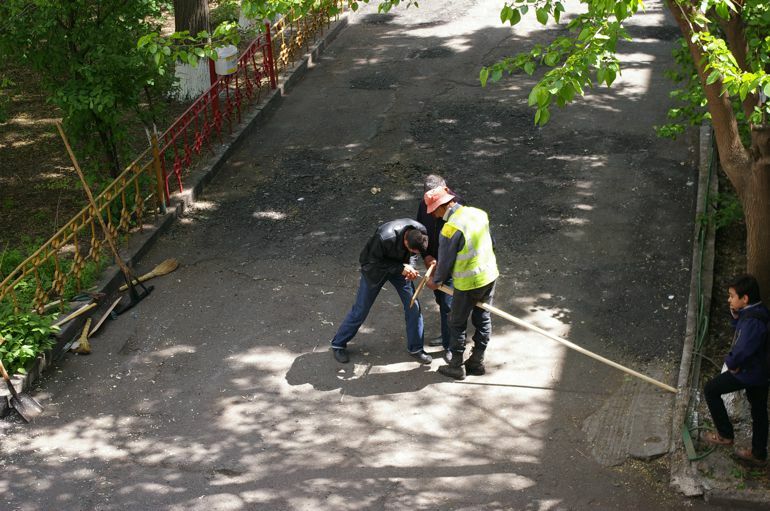 This is work the Yerevan municipality should have been doing anyway, regardless of whether elections were around the corner. It’s definitely a good thing. 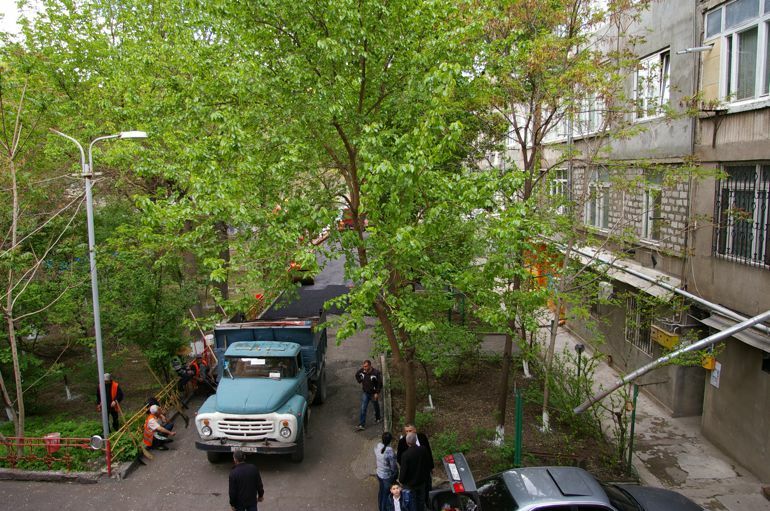 I really hope the upcoming Yerevan municipal elections are held democratically without vote rigging, intimidation, ballot stuffing, etc. But I’m not putting my hopes on that. I will, however, commend the great work the current administration is doing for my community, albeit four years plus late. At least it’s finally getting done. And I hope it continues, regardless of who’s in charge a few weeks from now. Despite the strange weather, rain for five minutes and muted sunshine for ten more, a sizable crowd gathered in Liberty Square to hear Raffi. The sound system was a lot better today and his voice boomed throughout the square, lambasting his critics while acknowledging recent “mistakes,” poor judgement or however you want to describe it. He seemed more strong willed than ever before. I was most impressed with the remarks his wife Armenouhi made. I wasn’t aware on that tumultuous night of April 9 she had been knocked down by the riot police and momentarily lost conscious, and when she came to she realized one of her shoes was missing, so she marched about barefoot for the rest of the evening. The tears that many saw in her eyes were not from pain, but for the policemen, who are essentially very young men as was made obvious in a recent photostory on Hetq and who were simply following orders, against their own will. I also cannot fault them for essentially doing their job, although no certainly one deserved to be bashed around and thrown to the ground. Having said that, there clearly were policemen, especially those in plain clothing, who were particularly cruel and unjustifiably callous in the way they handled the student protesters earlier in the day as amateur video footage revealed so candidly. 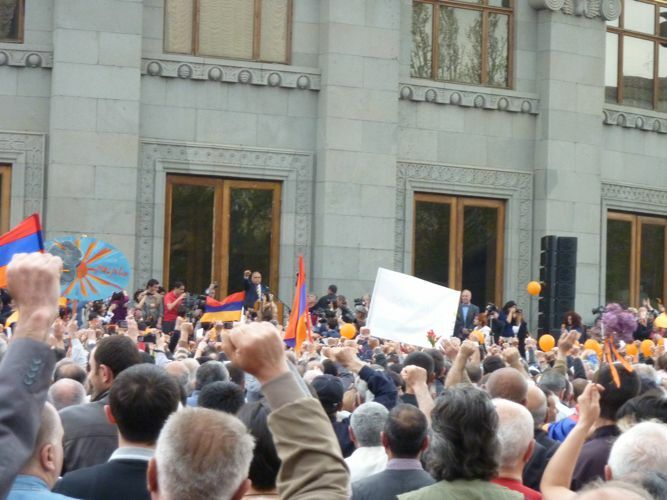 A week from now on April 9 a summit is planned at the Ani Hotel where political organizations, intellectuals and civil groups will devise a plan about how to move forward. It’s a step in the right direction. He didn’t touch upon his curious trip to Moscow on Thursday, not that he would, but that’s not actually important. What matters is that this movement continues to gather strength, despite the pitfalls it inevitably faces yet manages to rebound each and every time. 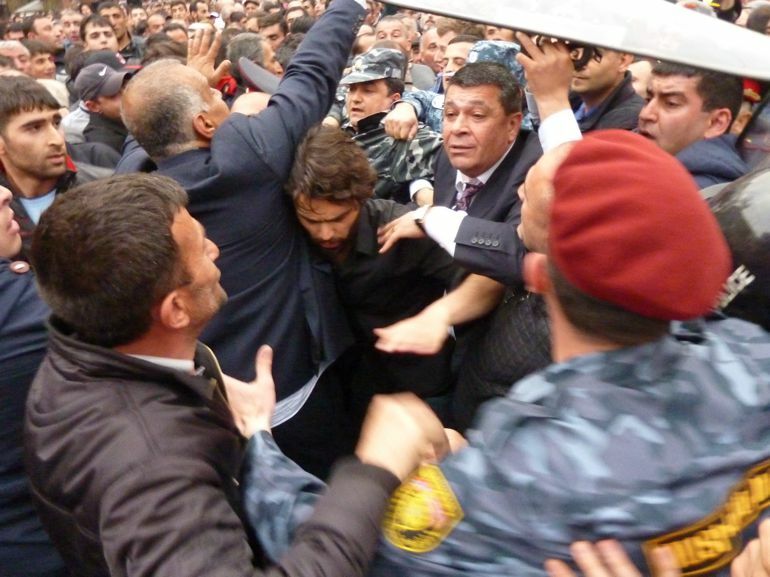 That seems to be what’s happening, although I have read and heard from many in the last several weeks that “Raffi’s not a leader.” Naturally, no one could ever expand upon that or give an example of what a leader in Armenia should be. 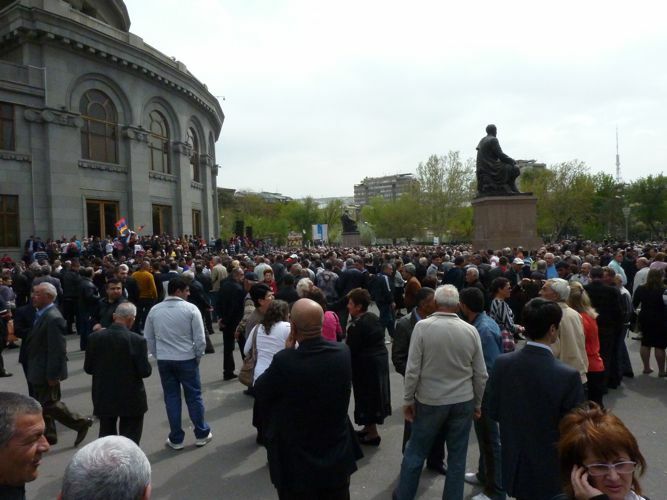 Like him or not, he clearly is one, and conscious Armenian citizens have faith in him. 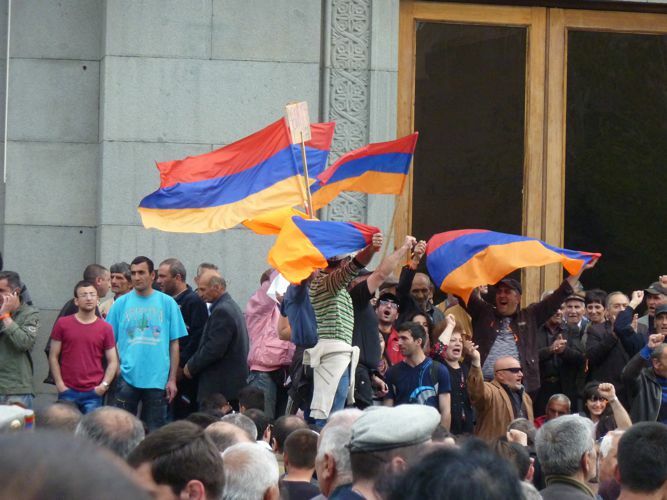 They are counting on him to deliver an Armenia that is full of promise, one where the rule of law functions and equal opportunity exists for all. What right does anyone have to discourage them? At tonight’s rally there were noticeably fewer people in attendance, perhaps a few thousand at the most. While walking through the crowd I discerned just how much people have become frustrated. Many kept demanding that change be made now rather than later, and asking “How?” whenever Raffi said that they would be victorious. 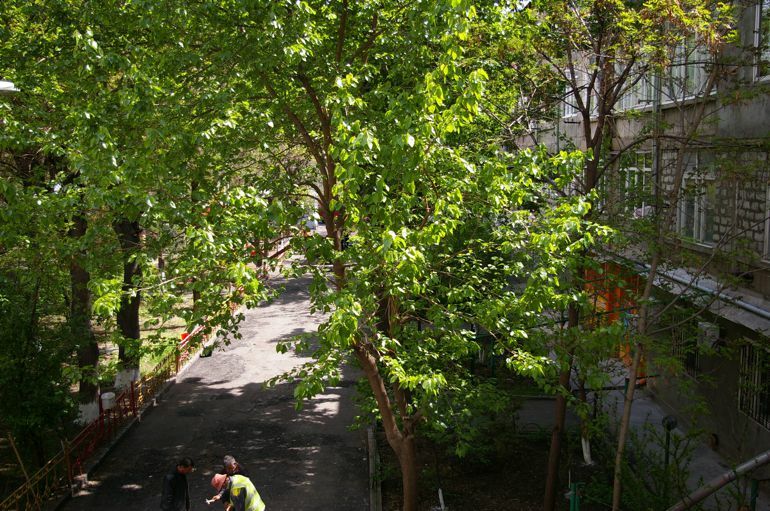 The continuing comments transformed into mild heckling, and after a speech of about 30 minutes Raffi announced that on their way to Tsitsernakabert they would walk past the presidential palace on Baghramyan Street. 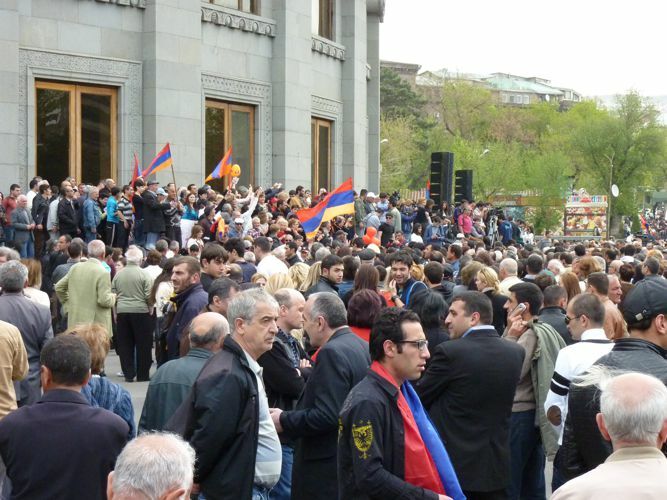 The Armenian police prevented Raffi Hovanissian and a pack of demonstrators from progressing along a specific route. Eventually he backed down and the march came to an end, but the 6:00 pm rally is still on. 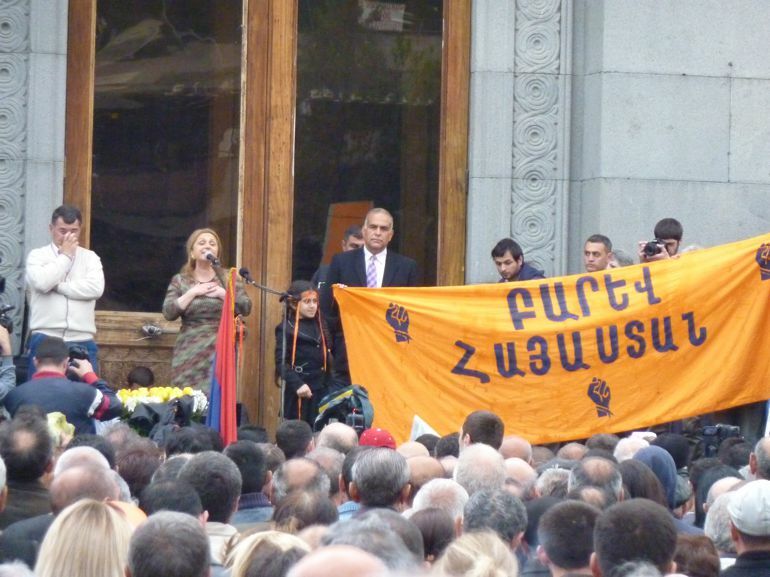 This afternoon, despite what many were anticipating, Raffi Hovanissian did not give his oath to the presidency before the Armenian public. Instead, he recited a pledge that the crowd of Barevolution supporters, copies of the constitution in hand, repeated, verse by verse. 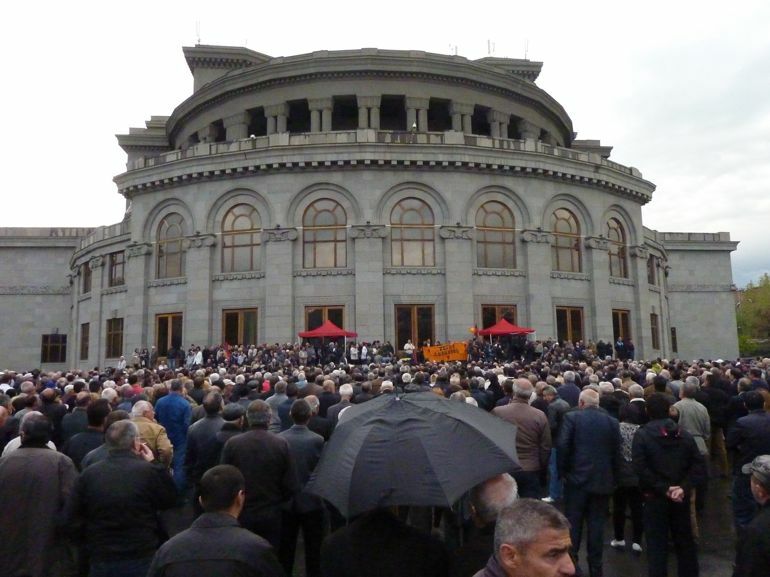 The rhetoric of his speech was the same–power to the people, the country belongs to the people, the people will all be victorious, the corrupt, dishonest leaders of Armenia will answer to the people in Liberty Square, yadda yadda yadda.